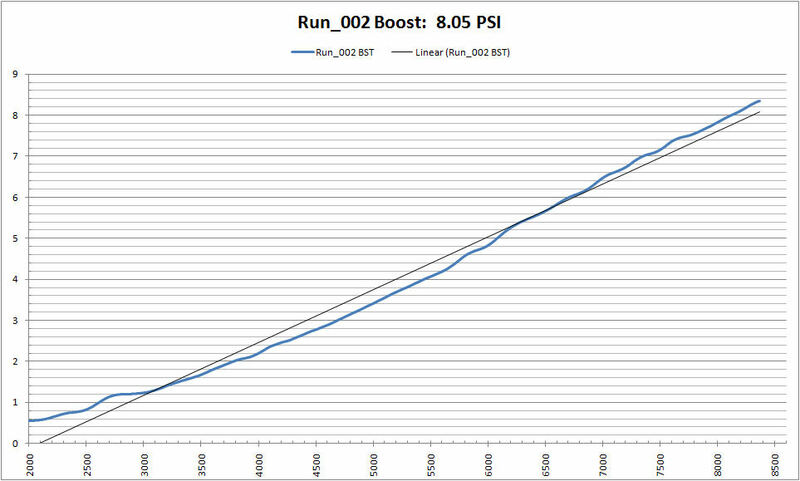 Boost pressure (8.05 PSI) verified with boost log. 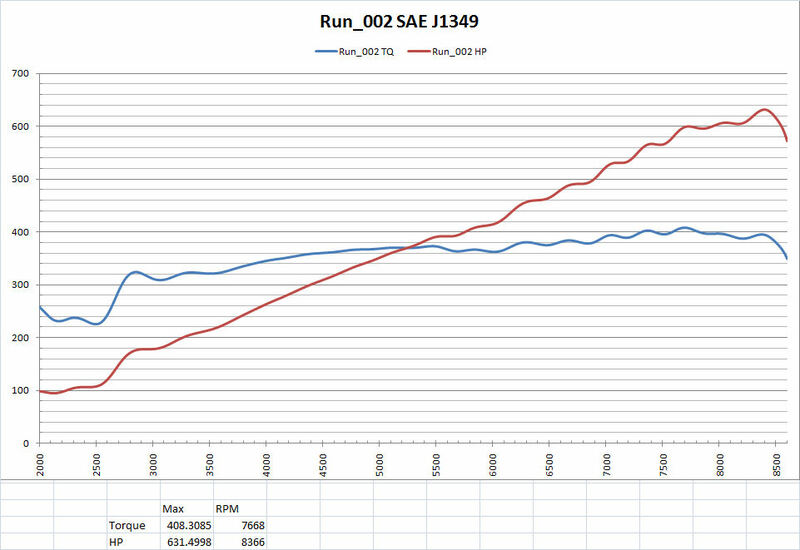 This graph shows the difference between the AFR's read via OBD port, and those seen by the AFR sniffer on the dyno. The AFR's on the OBD port are exactly what the ECU sees, and the AFR's fromt he dyno come at the tail end, after the mufflers, etc. Since the ECU reads Bank-1 and Bank-2 AFR's, both are included in this comparison. 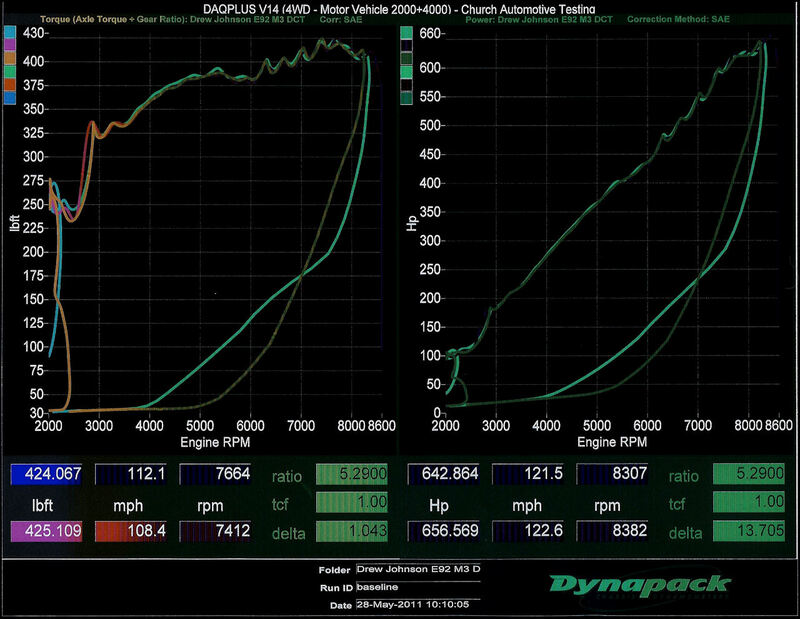 It appears from this graph, that the dyno sees the AFR's a little leaner than the ECU. All of the dyno runs are filmed in HiDef video to document the authenticity and independence of the tests. A Kestral 4500 portable weather station is brought to take independent weather measurements. This provides a cross-check for the dyno weather station to ensure that the dyno weather station is reading accurately and has not been tampered or altered in any way. There is no ice packed on the manifold. No water sprayed on the intercooler. No 10-minute breaks between runs. Individual dyno results are shown below. SAE corrected results are shown twice, using two different sources. The first source (dpc) are the SAE corrected results straight from the Dynapack. 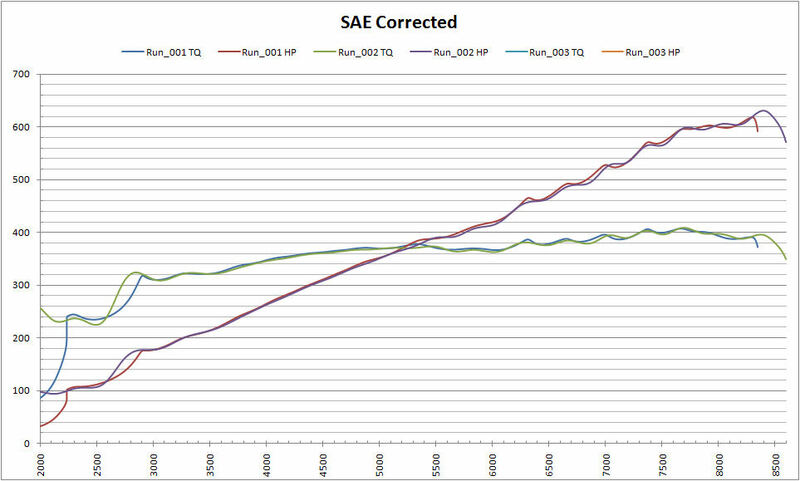 The second source (sae) of SAE corrected results are obtained by using the Kestral 4500 weather station data for each individual dyno run and running it through an independent SAE correction formula. This ensures that the dyno results are accurate and can be independently audited and verified for authenticity and accuracy. There are a few different horsepower correction standards. The two most common are STD and SAE. Dynapack "SAE-Corrected" is most closely related to "STD" but uses a different reference for humidity than the original STD standard. Dynapack changed their file format and we can no longer read the files. We had to rely on the dyno operator to export the dyno data as Excel spreadsheets. According to the dyno operator (Shawn Church) the boost gauge had a static pressure of 0.13 PSI. Shawn explained via text message that 0.13 PSI needs to be subtracted from all boost gauge results.